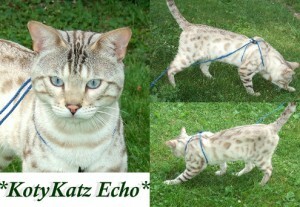 Pictured here at 3 and a half years old is our very own KotyKatz Echo. He is a seal lynx point Bengal with lots of acreage, rosettes, and a very large, solid build. His coat is maintaining great contrast with age. Echo has a great personality! He loves everybody! Echo’s pictures have been featured in the Bengal Bulletin, The International Bengal Cat Society’s official quarterly newsletter. If you’d like to see Echo’s pedigree, please click here. This entry was posted in Gallery, Reference Studs and tagged seal lynx bengal, seal lynx bengal kittens, seal lynx point bengal, silver bengal, silver bengal cat, silver seal lynx bengal cat, silver seal lynx bengal kittens, snow bengal cat, snow bengal kittens. Bookmark the permalink.